This week the Spanish branch’s relief society president decided to hold an appreciation dinner for all the missionaries. 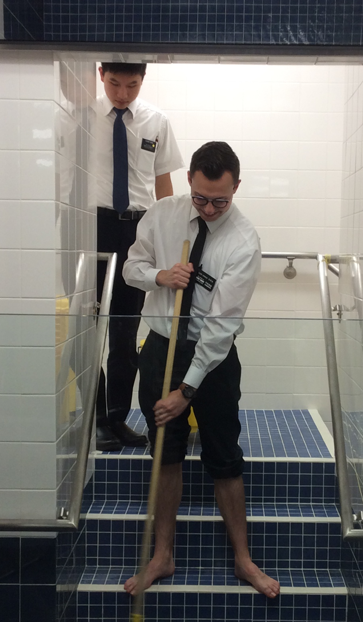 It was scheduled for last Saturday, but somehow none of the 18 missionaries knew about it! So that night there was also a baptismal service, a sports activity, and a couple lessons. Luckily it all happened at the Flushing chapel, so everybody was able to find out and finish up at around 7:45. Eventually we all went and had an AMAZING dinner- and they made us a cake and everything! They were all converts and they shared their conversion stories with us. It was so awesome to hear how regular teenage kids like us (with a very extraordinary calling) touched the lives of these people. It motivated me to be a little bit better, because there’s more of them out there, just waiting for 2 young missionaries and a miracle.